Developed in 1945 as a modernization of the T30 heavy tank. The vehicle was equipped with the 120 mm T53 gun and the new Continental AV-1790 engine. Because of the decline in heavy tank development after the end of World War II, the T34 never entered service. The prototypes were used in field trials. The T34 is the hardest hitting tier 8 heavy tank, putting out even more damage than the IS-3 armed with the 122mm BL-9. However, to balance these abilities the T34's cannon was given an increase in aiming time and also given a RoF of 4. This makes it tricky to play, especially for players who were used to the T34's pre-patch 0.7.2 tier 9 stats with a high RoF and accuracy. The role of the T34 didn't change with the patch, so you should stick to the second line and provide firepower where your allies need it due to the weak hull. When able to, stay back and play defensively, attack cautiously; any tier 7 and above gun can easily penetrate your weak hull. 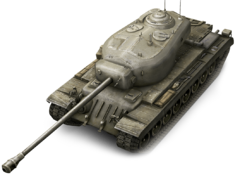 The credit income of the T34 is similar to that of the KV-5. Playing a good match will earn the player plenty of credits. The tank has a very weak hull so it's not recommended for leading a push. Try to only show your turret if possible and use hulldown tactics. T34 works very well when you can get behind cover and support your teammates, having a gun that can penetrate tier 10's with well placed shots and having turret armor that can bounce most enemies you are up against, proving to be a tank that cannot be ignored even by the biggest and baddest. A Vertical Stabilizer and Gun Laying Drive are both recommended to reduce the aim time. Having both makes the aim time and reticle size comparable to other tanks. That said, this tank has an interesting role to play. It can take on almost any tank it wants, even tier 10's, if the T34 can force a long range fight where the high alpha, penetration and accuracy combined with the hugely armored turret will make you nigh-invincible. However, if any tank; even some tier 4 tanks (i.e. T-50) get behind you they can easily kill you due to your terrible hull armor all around combined with your slow moving characteristics (albeit better than the Löwe and similar heavies) staying in the back line is crucial for this tank. Ignore the impulse, and your uninformed team in the suggestion to push. Support in the back line, and you will find this tank to be a formidable and powerful tank, and easily one of the best tier 8 tanks. However, be aware artillery is the bane of this tank. Sitting in a hull down position while also being artillery safe is imperative, and you must actively seek terrain that can fulfill one or both of these requirements, as these will shore up your vulnerabilities. In short, the T34 has very strong strengths, and crippling weaknesses. However, an experienced player will search for ways to remedy the situation, and bring the powerful gun to force. Patience is key with this tank, and it suits a defensive play style well. By the middle of 1944, combat reports from Europe describing the use of heavy tanks by the Germans stimulated new interest in the development of an equivalent American vehicle. The Pershing medium tank provided an answer to the early model of the German Pz.Kpfw. VI Tiger. However, although the latter was still in front line service, it had first been encountered by the US Army during 1943. By 1944, the Germans were introducing even more heavily armed and armored vehicles, like the Pz.Kpfw. Tiger II. Although the M26 Pershing was temporarily redesignated as a heavy tank for morale purposes, it clearly did not provide an answer to the problem. On 14 September 1944, US forces recommended development and manufacture of four prototypes for a new heavy tank. Two of these were designated as the heavy tank T29 and were to be armed with the 105mm T5E1 gun. The remaining two were designated as the heavy tank T30 and were to be armed with the 155mm T7 gun. In order to further increase the firepower of the T29 prototype, the US Army undertook design studies in early 1945 to modify the 120mm antiaircraft gun for tank use. These studies indicated that such a weapon, designated as the 120mm T53 gun, would have armor piercing performance superior to that obtainable with either the 105mm T5E1 or the 155mm T7. The new 120mm gun had a muzzle velocity of 3150 feet per second with a 50-pound solid shot, and development was in progress on a lightweight HVAP round with a muzzle velocity of 4100 feet per second. On 17 May 1945, the US Army recommended that two of the T30 prototype tanks be armed with the 120mm gun and redesignated as a heavy tank T34. This action was approved on 31 May. Originally, the T29, T30, and T34 heavy tanks were all to be powered by the Ford GAC engine. However, after VJ-day, the program was modified to permit the evaluation of other new power plants, and the military characteristics of the T30 were changed to specify the Continental AV-1790 engine, which was still coupled to the cross-drive transmission. On 7 November 1946, US Army recommended that the two T34 prototypes use the T30 chassis and that the characteristics of the T34 also be changed to specify the Continental engine. Prior to this, it had been intended to use the modified Allison V-1710 aircraft engine. However, use of the two chassis diverted from the T30 prototype program was recommended to reduce costs. 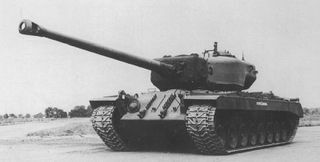 The T34 prototypes were similar in appearance to the T29 and T30 tanks, except for the longer barrel of the 120mm gun. Like the T29, the combination gun-mount was fitted with two coaxial .50 caliber machine guns on the left side of the cannon. The heavier weight of the 120mm gun required the welding of an additional four inches of armor onto the rear of the turret bustle to balance the long cannon. On the pilot tanks, this provided an obvious identification point. No doubt, if the tank had gone into production, the rear of the turret casting would have been thickened up and it would not have been so easily detected. Like the 120mm antiaircraft gun from which it was developed, the T53 cannon used separated ammunition. Thus, the ammunition stowage in the T34 was similar to that in the T29 and T30 tanks, which used the same type of round. The 120mm projectile and cartridge case each weighed about 50 pounds, so the problem of the two loaders in handling the ammunition was not as severe as with the 155mm gun in the T30. However, another problem arose during test firing at Aberdeen and Fort Knox: tests revealed that dangerous concentrations of smoke and carbon monoxide formed inside the turret after firing a few rounds. Also, flarebacks hospitalized at least two men at Fort Knox, and singed the hair and eyebrows of several others there and at Aberdeen. These flarebacks were caused by unburned powder gases in the gun tube being sucked back into the turret by the pumping action of the ejected cartridge case. A flash resulted when these hot gases mixed with the oxygen in the turret. To prevent the flarebacks, a bore scavenging system was developed using compressed air to sweep out the gun tube before the breech opened. However, this complex arrangement resulted in leaks at the various valves, and required space for an air compressor and reservoir. A simple solution to the problem was the installation of an aspirator-type bore evacuator. Previously tested on the 90mm T15E4 and M3E4 cannons, it consisted of a cylindrical chamber fitted around the gun barrel just behind the muzzle. Holes angled towards the muzzle were drilled along the barrel wall and connected the bore with the evacuator chamber. As the projectile moved down the tube past these evacuator ports, the high gas pressure in the bore also pressurized the evacuator chamber. Once the projectile cleared the muzzle, the pressure in the bore dropped rapidly and the high pressure remaining in the evacuator chamber caused the formation of high velocity gas to jets from the evacuator ports. These jets angled toward the muzzle, sweeping the powder gas out of the bore before the breech opened. Tests at Aberdeen and Fort Knox showed that this simple device was extremely effective and it became a standard feature of new tank guns. The T29, T30, T32, and T34 series of tanks were used to evaluate numerous experimental components after World War II. Although too late for the war for which they were designed, they provided invaluable service in developing these components for later tanks. Much of the work making the early AV-1790 engine and the CD-850 transmission a reliable power package utilized these tanks. Later, these prototypes were used in the development of other power train components, such as the XT-1400 transmission, which was tested in the T30. This page was last modified on 18 January 2015, at 21:31. This page has been accessed 3,826 times.